You must think that this is a peculiar idea. Homes are either wired with cable/satellite signals (and piracy is not the issue here) or else they are not. 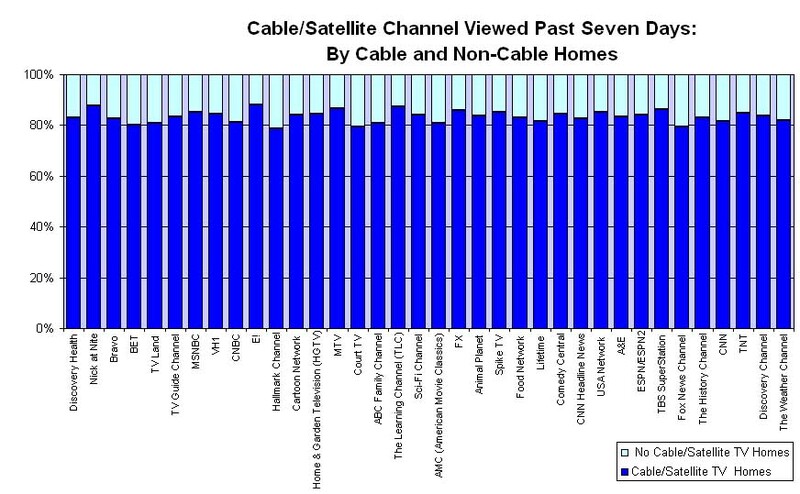 By definition, it would seem that only cable/satellite viewing can only occur inside cable/satellite homes. None of this is being challenged. However, in survey research, the most standard question for cable/satellite channels is: "Did you watch Channel XYZ during the last seven days?" It is noted that there is no requirement for the viewing to take place within the home. It is perfectly alright if you go to the pub and watch the evening football game, or a friend's house to watch a game show. We will now refer to some survey data taken from the MARS 2006 study. This is a mail survey of 22,345 adults in the United States conducted during the first quarter of 2006. Within the survey, the respondents are asked if they subscribed to cable (including digital) and satellite television. Regardless of the response to that question, they are next shown a list of cable/satellite channels and asked if they had viewed any of these within the past seven days, irrespective of the place. The results are shown in the following table, with the past-7-day viewing shown separately by cable and non-cable adults. This list has been arranged by order of total adult viewing. 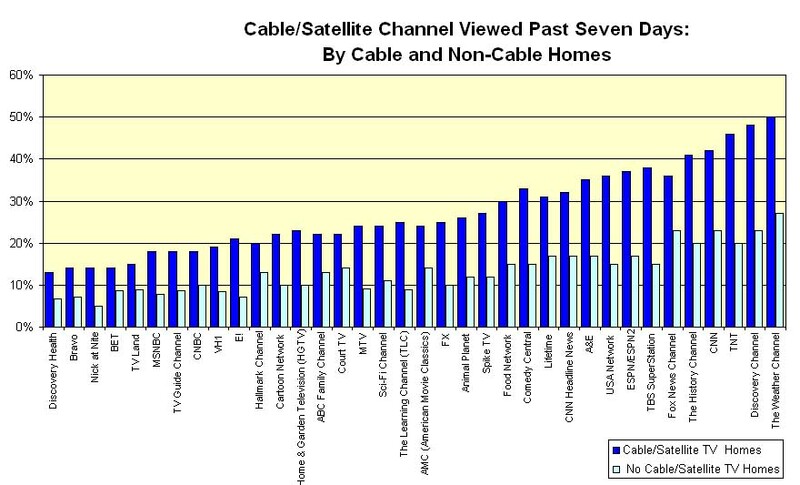 The average cable channel is watched by 27% of cable home adults and by 13% of non-cable home adults. Now it is necessary to appreciate that this does not mean that 67.5% (=100 x 27/(27+13)) of an average cable television program is being watched at home and 32.5% outside. That is because the measured entity is "past seven days viewing" and not "average program viewing." We note that 99% of all cable home adults watched one or more of these channels in the past seven days, compared to 83% of all non-cable home adults. Again, those are not average audiences. Here is another way of looking at the same data. In the following table, everything is put in terms of the number of projected viewers (in multiples of 1,000) and then converted into shares (that is, the sum of the cable versus non-cable shares add up to 100% for every cable channel. The average percent of cable home viewers among all viewers is 86%. If we were measuring on an average program basis, this number is expected to be smaller.